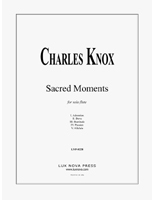 Sacred Moments originated as three short pieces intended for used as interludes in a worship service at Druid Hills Presbyterian Church in Atlanta, Georgia. The simplicity of short pieces and an unaccompanied single-line instrument seemed appropriate for the particular occasion. Adoration, Dove and Alleluia were the movements presented in the service. Later Beatitude and Passion were added to complete the cycle of some of the most memorable moments in the life of Christ. The dedication is to Ann Spauchus, who was soprano soloist at Druid Hills Presbyterian Church at the time the original three pieces were first presented. After her death, the other two movements were added.